More journalists were killed in 2009 than ever before and most were deliberately targeted. The majority of victims since 1992 have been beat reporters doing their job -- not investigative reporters or ones who died in combat. In Afghanistan, outright homicides account for 59 percent of journalists killed since 1992. In Iraq, 63 percent of journalists killed since the US-led invasion in 2003 were murdered. This essay first appeared in the Harvard International Review. More journalists were killed last year than ever before. No doubt the world has become a more dangerous place for journalists, but not necessarily in ways that people might expect. The risks to foreign journalists, especially for (but hardly limited to) Western correspondents, have risen dramatically. Some of us are old enough to recall a time back in the 1980s when raising a white flag and writing TV in masking tape on a vehicle might help keep one safe. But in recent years reporters for outlets from The Wall Street Journal to Al-Arabiya have been attacked in ways which demonstrate that being a journalist may only make one more of a target. The untold story, however, is the following: the risks to local journalists, or journalists who report within the borders of their own nation, have never been greater. In fact, the risks that local journalists face have long been severe. The difference is that, now, perhaps more Western-based international observers and groups are taking notice. Nearly three out of four journalists killed around the world did not step on a landmine, or get shot in crossfire, or even die in a suicide bombing attack. Instead, no less than 72 percent of all 831 journalists killed on the job since 1992, according to data compiled with other figures cited below by the New York-based Committee to Protect Journalists (CPJ), were murdered outright, such as killed by a gunman escaping on the back of a motorcycle, shot or stabbed to death near their home or office, or found dead after having been abducted and tortured. The pattern of most journalists murdered in reprisal for their work, as opposed to being killed by the hazards of combat reporting, holds true even in war zones. In Somalia, more than half (53 percent) of journalists killed did not die in anything like a firefight or bombing attack; instead, they were individually murdered. (See a Nieman Watchdog story on Mohamed Olad Hassan, a Somali journalist.) Similarly, in Afghanistan, outright homicides account for 59 percent of journalists killed. In Iraq, which by any measure has been the most dangerous nation for journalists on record, 63 percent of journalists killed since the US-led invasion in 2003 were murdered. Atwar Bahjat was an Iraqi journalist and contract correspondent in Iraq for Al-Arabiya, a television network based in the United Arab Emirates and partly owned by the Saudi broadcaster Middle East Broadcasting Center. Bahjat had previously reported from Iraq for Al-Jazeera, the satellite television network based in Qatar and partly financed by the nation’s Emir-led government. In 2006, Bahjat and her TV crew were reporting at the site of the Shi’ite Askariya shrine, also known as the Golden Mosque, in Samarra immediately after it had been bombed. A surviving crew member said that armed men driving a white car attacked the crew and demanded to know the whereabouts of the on-air correspondent. Her remains and those of two crew members were found the following day. Bahjat’s corpse in particular, according to a mutual friend interviewed by this author, bore unmistakable signs of torture. The killing of local journalists is most common. Nearly nine out of ten journalists killed on the job, or 87 percent, were murdered or otherwise killed within their own nation. Many people have heard of the Russian investigative journalist Anna Politkovskaya, who, after her repeated exposés on human rights abuses in the Russian province of Chechnya, was shot to death in October 2006 in the elevator of her apartment building. But how many people beyond the northern Mexican town of Saltillo have heard of Valentín Valdés Espinosa, a young general assignment reporter for Zócolo de Saltillo, whose tortured corpse was found in January 2010 after he reported the arrest of an alleged local drug lord? Or how many people outside of the Sindhi-speaking area of Pakistan have heard of Ghulam Rasool Birhamani, a middle-aged reporter for the Daily Sindhu Hyderabad, who was abducted, tortured and left for dead in May 2010 after reporting on an arranged, tribal marriage involving a 12-year-old girl? Or how many people outside of Indonesia have heard of Ridwan Salamun, a young correspondent and cameraman for Sun TV, who was stabbed to death in August 2010 while filming violent clashes between two villages? The evidence in 2009 continues to bolster the same point. CPJ recorded a record 72 journalist deaths last year. The unprecedented toll stemmed largely from the November massacre of 30 journalists out of 57 people killed in one incident during election unrest in the Philippines’s Maguindano province. Keep in mind that CPJ figures are by and large consistent with those provided by other global monitors, including the Paris-based Reporters Without Borders and the Brussels-based International Federation of Journalists, except for two possible cases. When it comes to journalist murders, CPJ only includes those cases where researchers have investigated the motive to determine that a journalist was murdered in retaliation for his or her work, as opposed to, say, a business arrangement gone bad, a land dispute, or even a love triangle. In 2009, for example, no fewer than 24 journalists were murdered that year whom CPJ excluded from the record total of 72 journalists killed because a motive in each of these outstanding cases has yet to be determined. Each year, on average, CPJ records dozens of outstanding cases with motives under investigation. CPJ’s annual figure of journalists killed worldwide also excludes murders of media workers such as drivers and translators, which in 2009, for example, numbered three. The resulting figures still stand up under scrutiny, and they are staggering. At least 599 journalists have been murdered since 1992, according to CPJ statistics. To put it another way, a journalist is murdered somewhere around the world at least once every 11 days. Most of them were not even investigative journalists, but simply beat reporters trying to get the story. More than nine out of ten of the murdered journalists, or 93 percent, were local newsmen and women. There is another trend that is even more disturbing. When it comes to journalists, the killers get away with the murders in nearly nine out of ten cases. In no less than 89 percent of journalist murders worldwide, there has been little or no prosecution whatsoever. Moreover, only in four percent of journalist murder cases has full prosecution occurred, which in most cases means that both the assassins and the masterminds who ordered or hired them, have been brought to justice. In 2005, a judge in Nicaragua found a local politician guilty of the murder of journalist Maria José Bravo, a correspondent for the Managua daily La Prensa. Bravo had been killed in the previous year upon leaving a voting booth during claims of election irregularities. In 2004, a military court in the Ivory Coast found a police officer guilty of the murder of journalist Jean Hélène, a French correspondent with Radio France Internationale, who was shot in the head outside the national police headquarters while waiting to interview an opposition activist. But such convictions remain rare, especially when they involve local correspondents. The number of unsolved journalist murders is a figure which hits as hard as a bullet, however, in all too many nations. The latest Impunity Index covers the years 2000 through 2009, and includes nations with at least five unsolved journalist murders over the same period. Iraq tops the list with no fewer than 88 journalist murders out of a population of over 31 million, followed by the much smaller nation of Somalia with nine unsolved journalist murders in a nation of nine million people. Few are surprised to see either nation top the list. But the countries that follow may not be expected. Three democratic nations (nations with a reasonably long history of competitive national elections) come next: the Philippines, Sri Lanka, and Colombia. 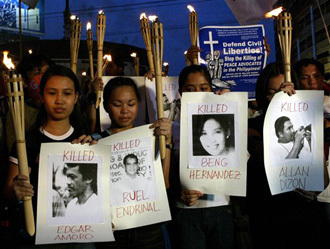 The Philippines has had 55 unsolved journalist murders so far in the past decade out of a population of 90.3 million. The smaller nation of Sri Lanka has seen 10 unsolved journalist murders out of population of 20 million; Colombia, 13 out of over 44 million. All the remaining nations on the list are also all at least nominal democracies, although a few if not more for different reasons may not be arguably worthy of even that term: Afghanistan, Nepal, Russia, Mexico, Pakistan, Bangladesh, and India. The ongoing problem of such impunity in murdering journalists cuts across geographic and political boundaries, perhaps the single greatest threat to press freedom worldwide. But it also raises questions that go beyond the traditional bounds of press freedom monitors. One thing, however, is clear: in the post-Cold War era, civilian government institutions, which include judicial and law enforcement capabilities, remain woefully weak in many nations, while military or intelligence agencies continue to dominate many of the same nations. Who is behind all these journalist murders? The answer is also not what many might expect. Government officials of one kind or another have killed nearly as many journalists as terrorists or other political movements and groups. In fact, if one adds government-backed paramilitary groups to the list, government officials along with their paramilitary allies have murdered more journalists than terrorists and other anti-government groups. Individual CPJ case capsules—which, along with all other data cited here, are available online—have identified anti-government political groups and movements, including terrorist organizations, as being the most likely perpetrators of at least 30 percent, or 180 cases, out of a worldwide total of 599 murders since 1992. Civilian government officials are considered the probable perpetrators of 24 percent of journalist murders. Military government officials are responsible for another five percent, and pro-government paramilitary groups are responsible for seven percent, or of about 41 murders over the same period. The repercussions of the murder also stretch beyond the incidents themselves. The murder of any one journalist sends a signal to countless others that they or members of their family could well be next. Many journalists have been threatened, sometimes repeatedly, before being murdered. But countless more journalists have been warned not to travel the same path. Unfortunately, from the perspective of the perpetrators or those who wish to keep the press from reporting on their own wrongdoings, murdering a journalist makes cold-blooded sense. In the 1980s, many journalists were murdered while covering human rights abuses. In the past two decades, more journalists have been killed while reporting on corruption, such as collusion between government actors and organized crime. Murdering some journalists, while threatening to target even more, generates fear that is hard to measure. Self-censorship has become routine in nations from Colombia to Mexico. After the tortured remains of previously mentioned Mexican reporter Espinosa were discovered, no other reporter in the city of Saltillo attempted to report on why Espinosa had been killed. In fact, his newspaper, Zócolo de Saltillo, went in the other direction entirely and stopped reporting on organized crime, according to a senior editor who asked to remain anonymous. The unchecked proliferation of journalist murders also challenges some of the precepts behind global press freedom indices produced by groups like the Washington, D.C.-based Freedom House as well as Reporters Without Borders. Based on a multiplicity of factors, their global indices, when evaluating another democratic nation like the Philippines, must somehow weigh the value of a relatively open environment for the press to criticize the government and report on a wide range of other topics against the disvalue of journalist murders. Multilateral institutions like the World Bank are only beginning to come to grips with this ongoing problem, and how to factor it into decisions concerning loans and other economic support to nations. In fact, while economic and health indicators like gross national product and infant mortality per capita have long been used to determine levels of economic development, another way to measure development would be to examine the rate of prosecutions for murders. Hard, comparative data on the topic is not readily available. But one factor that clearly separates the world’s most developed nations from most other nations is that in most G-8 nations, for example, most murders are solved. In contrast, throughout much of the world, the global rate of impunity for unsolved journalist murders approaches 90 percent and largely appears to be replicated for the murders of other citizens as well. At the same time, combat journalists and other reporters who cover dangerous situations still face great risks. No less than 18 percent of the journalists killed on the job in all circumstances since 1992 died covering combat or some other form of military engagement. Another ten percent were killed during reporting on matters like violent demonstrations. Among field reporting incidents, disputed shootings have received the most attention. What’s the difference between a murder and a disputed shooting? In a murder no one doubts that a homicide occurred; the question is who did it. In most disputed shootings, everyone knows who fired the ordinance that killed the journalist; the question is whether the firing was justified. Few cases have received more scrutiny than the August 2003 shooting of Reuters cameraman Mazen Dana outside the Abu Ghraib prison in Iraq. He was in a car with members of his crew after filming outside the walls of the jail when a US Army tank approached their position in the street. Dana got out of the car, put his camera on his shoulder, and began walking in the direction of the tank as he was filming it. A gunner atop the tank opened fire, hitting Dana fatally in the chest. The soldier who fired later said that he had seen a dark-skinned, dark-haired man in black clothing, and mistook Dana’s camera for a rocket-propelled grenade launcher, according to a US military investigation of the shooting that was later declassified and released to the public. The US military exonerated the soldiers involved. But the same report also included a recommendation that commanders should review the military’s own rules-of-engagement for potential modifications to try and avoid such incidents in the future. Human Rights Watch and CPJ would later make a similar recommendation in a 2005 letter to then-Defense Secretary Donald Rumsfeld. In fact, since 2003, at least 16 journalists have died and others seriously wounded by US forces’ fire in Iraq. US military authorities have conducted investigations in less than a handful of cases, but the investigations exonerated the soldiers involved in each case. It remains unclear whether, or to what degree, the US military may have reviewed its procedures in response to the recommendations by its own investigators and others. Another well-known disputed shooting involved Israeli Defense Forces and British freelance cameraman and film director James Miller, who was working on a documentary for the TV channel HBO in Gaza in May 2003. Miller and his crew were working out of the home of a Palestinian family as they filmed the army’s demolition of houses in an area that the Israeli army alleged contained tunnels used to smuggle arms. Near midnight, the television crew decided to leave the home and walked toward a fixed position of Israeli troops and armored personnel carriers 300 feet away. The journalists were wearing jackets and helmets marked “TV,” as was later shown in the HBO documentary. One crew member waved a white flag, while Miller used a flashlight to illuminate the flag and also shouted a greeting as they approached. A shot was fired. The group yelled that they were British journalists, and a second shot was fired immediately after. The video shows the second shot hitting Miller, who was struck in the neck. Several more shots followed. An Israeli army spokesman first said that troops in the area returned fire after being fired on by rocket-propelled grenades. Later, the army said that Miller was struck by a bullet from behind, claiming that he may have been hit by Palestinian fire. Israeli authorities exonerated the soldiers involved; exhortations by CPJ and others for the Israeli army to conduct a transparent investigation into the shooting were not heeded. These incidents and others helped compel a group of journalists based in Geneva, Switzerland, who cover the United Nations and other multilateral agencies, to form a group with two goals: to establish a universal press emblem and to work to modify the Geneva conventions, making it an explicit war crime to target journalists. Most global press freedom groups including CPJ, Reporters Without Borders, the International Federation of Journalists, as well as a consortium of groups based in Europe known as the International News Safety Institute opposed the changes. Global press freedom groups argued, first, that establishing a universal press emblem would require the formation of a regime to determine who would be eligible to don the emblem and that this would be tantamount to establishing a licensing regime which would determine who is and who is not a journalist. Such a step would only feed efforts by repressive regimes, the global press freedom groups went on, which already sought to restrict journalists by licensing them according to political criteria. Second, it is already a war crime to target civilians, a category which includes journalists (journalists who are embedded with military forces may be legitimately targeted, as they legally become a part of the military unit to which they are embedded). Thus, to make the targeting of journalists an explicit war crime would not only be redundant and unnecessary; it would also send the message to the public that journalists saw themselves as special and somehow more important than other civilians. Violence, of course, is only one way to silence the press. In many so-called closed or restrictive nations, especially those controlled or dominated by a single political party or monarchy, outright censorship of the press and imprisonment for individual journalists who persist in crossing the line is the most common reprisal. For 11 consecutive years, China was the world’s leading jailer of journalists. But Iran usurped China to hold that dishonor after jailing dozens of journalists in the wake of election unrest in 2009. Cuba is next on the list, followed, unfortunately, by sub-Saharan Africa’s newest nation, Eritrea. Two trends also stand out. In 2008, online journalists of one form or another surpassed print and broadcast journalists as the largest single category of journalists imprisoned around the world, comprising nearly half of those incarcerated. In the following year, the number of jailed freelance journalists nearly doubled from the previous three years to similarly make up almost half of incarcerated journalists. Both trends are likely to grow: Further digital advances will empower more freelance journalists to venture out on their own, while newsroom cutbacks, especially in newspapers in most developed nations, will lead to more freelancers on the market. One should also not forget that many methods to restrict the press fall somewhere in between the more obvious means of violence or imprisonment. For instance, ruling party thugs have intimidated and attacked journalists in the streets from Zimbabwe to Venezuela; government officials and other public figures have brought criminal libel suits against journalists from Thailand to Morocco; national agencies have ordered impromptu tax audits against news outlets from the Ukraine to South Korea. In nations such as Hong Kong and Argentina, governments have manipulated private or public advertising to punish media outlets’ critical reporting, as was recently documented by the Center for International Media of the US-funded National Endowment for Democracy. Serious challenges lie ahead. The Committee to Protect Journalists has launched a Global Campaign Against Impunity, which aspires both to raise awareness among the public in nations like the Philippines about the value of journalism to society, and to pressure law enforcement authorities to bring the murderers of journalists to justice. Some progress has already been made in Latin America to resolve a number of journalist-murder cases, due to efforts by the Inter-American Press Association. There is no doubt, however, that progress will take time. But the first step toward solving any issue is to acknowledge it. One should also keep in mind that behind every figure is a face, and most likely also a family, friends, and colleagues, all of whom suffer from a journalist’s persecution or death. Think Daniel Pearl, Atwar Bahjat, or Valentín Valdés Espinosa. Clearly there is much more to say. I am very glad to see the author emphasize to readers that reporters are retaliated against for what they do. The clear evidence of this compiled by CPJ, apparently for all countries outside the USA, brings into sharp focus that the risks of this outstrips exposure to combat. The article also notes that beat reporting is more dangerous than so-called investigative reporting. This is no surprise and involves a bit of a misnomer. Beat reporters are in daily contact with the subjects, entities and topics they report on. Historically the best investigative reporting emerges from the beat. Few outside the profession seem to understand that reporters who are purely investigative journalists are generally senior reporters given the freedom to disengage from daily exposure to a beat and the pressures to maintain daily access. The best investigative reporters know that this is a luxury afforded by seniority and mightily try to stay close to the beat anyway. Nevertheless, they are insulated by the ability to remove themselves, work from afar, break from daily exposure in response to threats, break from predictable routines. At worst, they sometimes are parachuting into and out of stories/beats to perform an investigation in areas they will never become entirely familiar with except second hand through consultation with beat reporters. Most of the best investigative reporters I know only describe themselves as that as a shorthand way of acknowledging that on their beats they developed questions and uncovered issues that led them into in depth investigations. But they too are at risk, because, as the article illustrates so well, journalists are targeted for doing their jobs. One suggestion to CPJ. It needs to be explicit that in triaging incidents worldwide it does not apply the same level of rigor to reporting violations against journalists in the U.S. I would like CPJ to discuss this a bit so that the work of CPJ isn't misleading to those that follow its website and its reports. Because the US is relatively safe, and because so many journalists are being killed elsewhere, many instances of journalists detained, harassed or threatened with arrest in the US for doing their jobs are not investigated by CPJ or listed by CPJ on the USA section of its website. Reading the USA section therefore leaves a false impression. Contrary perhaps to popular perception, domestic organizations are not doing a thorough job of documenting abuses here. Self censorship, consolidation of media power, and increasing reliance on freelancers left to fend for themselves is creating a vacuum that organizations like SPJ or RCFP not only sometimes fail to address but even in some respects contribute to. CPJ has its hands full covering the globe and its hot spots.